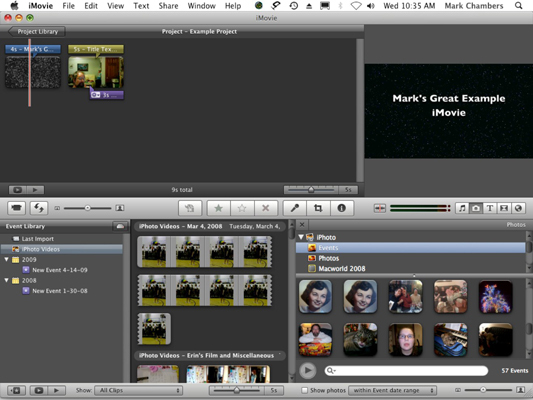 When you’re making a movie with iMovie 09, still images come in handy as impressive-looking titles or behind ending credits. (Make sure you list a gaffer and a best boy to be truly professional.) However, you can also use still images to introduce scenes or to separate clips according to your whim. Adding images from iPhoto: Click the Photo Browser button in the Browser toolbar (or press Command+2) and you’ll experience the thrill that is your iPhoto Library, right from iMovie. You can elect to display your entire iPhoto Library or more selective picks, such as specific albums or Events. When you find the image you want to add, just drag it to the right spot in the Project pane. Pulling still images from iPhoto is child’s play. Importing images from your hard drive: If you’re a member of the International Drag-and-Drop Society, you can drag TIFF, JPEG, GIF, PICT, PNG, and PSD images directly from a Finder window and drop them into the Project pane.